Have you noticed a nest forming with flying insects that can use their behinds to sting you? Chances are you’re not happily volunteering to remove this problem from your home or property and we don’t blame you. Regardless if you’re dealing with bumble, honey or ground bees, wasps, hornets, carpenter bees or yellow jackets – they all pack a nasty sting! But the professional bee and wasp exterminators at Echo Tech have the skills, equipment and know-how to eliminate your possibly painful and health threatening problem in the St. Paul, MN area. Do you think it’s weird because you’re only noticing a new nest now? Are your stinging insects a little late in the season? Nope, they are actually right on time! What you have found is the nest sight that will protect the new Queen Bees/Wasps until next spring. All the diligently working, stinging and flying bumblebees and wasps will die soon but they leave their legacy in the autumn nests they’ve created because the newly produced queens will stay dormant and survive the winter, to then fly off to make yet another nest in spring. You never see insects in the winter, so they must die off. Right? Wrong! They merely vanish from our sight but could be hibernating in your drywall, attic or any other warm, cozy place they happen to come across. And this Autumn nest that you found, well it’s being prepared for the winter months, so the Queens stay safe and come spring they are unaffected by our Harsh Minnesota weather, then go on to prosper. If you see a nest, winter will not take care of it. If you want it gone and no surviving members left to find another place on your house to nest contact the professional exterminators of Echo Tech. 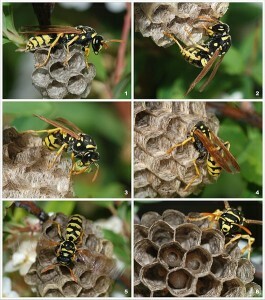 Some wasps, like yellow jackets, actually become more aggressive in fall. It might be the impending doom of winter, the overtime they’ve been spending on their latest nest creation, all for a Queen they’ll never have a chance with…Regardless of what’s bugging this insect, many times we fall victim to their hostile demeanor. That beeing said (pun intended), wasps are known to pack the most intense sting! If you’ve noticed a bee or wasp nest in your window seal, under your deck railings, in your gas grill, mail box, light fixture, under your hood, on your fascia, trees close to your home or any other places on you property that may pose a health threat to your family or visitors contact Eco Tech today, we don’t play! Our number is 763-785-1414 or if you need emergency extermination services call 763-232-7296 now!